The North Carolina Literary Review incorporates photos and art with stories and poems and takes a scholarly publication one step further. Margaret Bauer stood before a group of North Carolina writers in The Chelsea restaurant in New Bern last summer and posed a question. How many of you, she asked, are subscribers to the North Carolina Literary Review (NCLR)? Bauer surveyed the room as about a third of the 80 or so attendees raised their hands. The question hinted at a conundrum facing NCLR, one of the South’s most unusual and respected annual literary publications: Why, outside of small circles of literati, is it largely unknown? NCLR presents the work of prominent North Carolina writers and poets in a bold design. But Bauer, NCLR’s dogged editor, remains frustrated that she is unable to sell even the 1,000 copies printed annually. NCLR was founded at East Carolina University in 1992 as a companion publication to the North Carolina Historical Review. Every year, Bauer and her team of volunteer editors accept submissions from writers with ties to North Carolina. The works include fiction, creative nonfiction, poetry, interviews, and scholarly reviews of literature, all related to a theme. In recent years, themes like drama; humor; environmental writing; and, in 2012, literature into film have been explored with a clear North Carolina slant. But this isn’t your grandfather’s academic journal. Photos and illustrations complement the pieces, giving NCLR the modern feel of a magazine rather than a traditional, stuffy scholarly review. “That mix of beautiful art and text just comes to life in this journal, and you really can’t find another example, I think, in the literary world today that celebrates in this way,” says Dana Ezzell Gay, a Meredith College graphic-design professor and a freelance art director for the review. 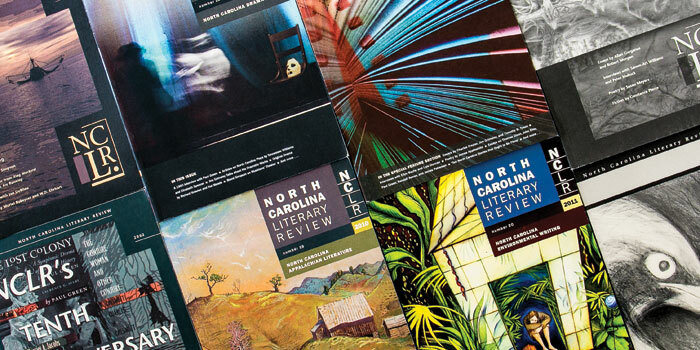 When NCLR is published each summer, the works of established North Carolina writers and poets, such as Jill McCorkle, Cathy Smith Bowers, Charles Frazier, and Clyde Edgerton, are presented alongside those of the state’s aspiring stars. Bauer includes each edition’s finalists and winning entries in the Doris Betts Fiction Prize and James Applewhite Poetry Prize competitions. Bland Simpson, a well-known author, musician, and UNC professor, praises NCLR’s unique look and compares it to a mass reading of the state’s top writers. Although Bauer frequently organizes readings at independent bookstores across the state to promote NCLR, she still struggles to popularize the brand after 21 years of publication with no marketing budget. She has never sold out despite the $15 cover price and the $25 cost of a two-year subscription. Kathryn Stripling Byer, a former North Carolina poet laureate and a frequent contributor to NCLR, agrees that the review’s appeal could be broader. Undeterred, Bauer carries on. That day at The Chelsea, the show-of-hands strategy worked. She sold two dozen subscriptions, the most she’d ever sold in one place.